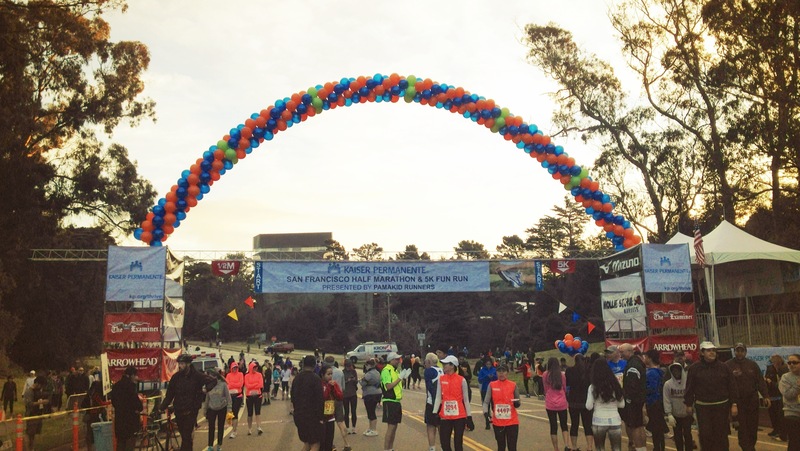 This past Sunday, I ran in the Kaiser Permanente San Francisco Half Marathon. 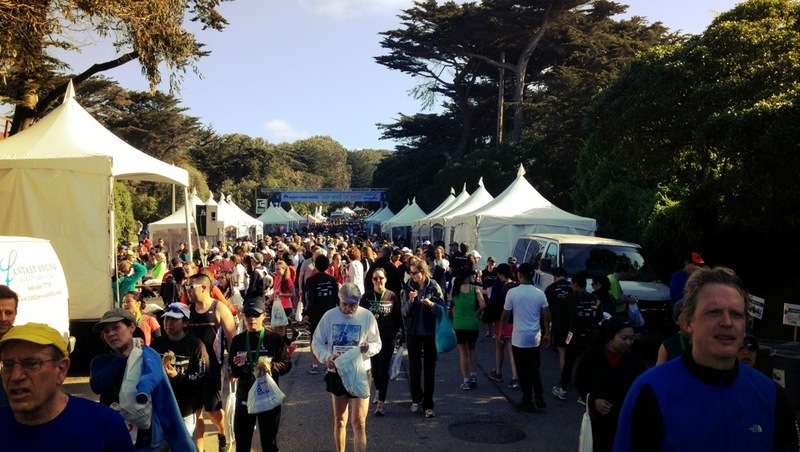 The event, which was celebrating its 30th anniversary, actually had two distances: a 5K and the half marathon and drew a field of 2,549 and 5,744 finishers respectively. The weather was perfect: cool, clear, and no wind to speak of at all – though a few of us were nervous about what would be found when we reached the coast section of the course. 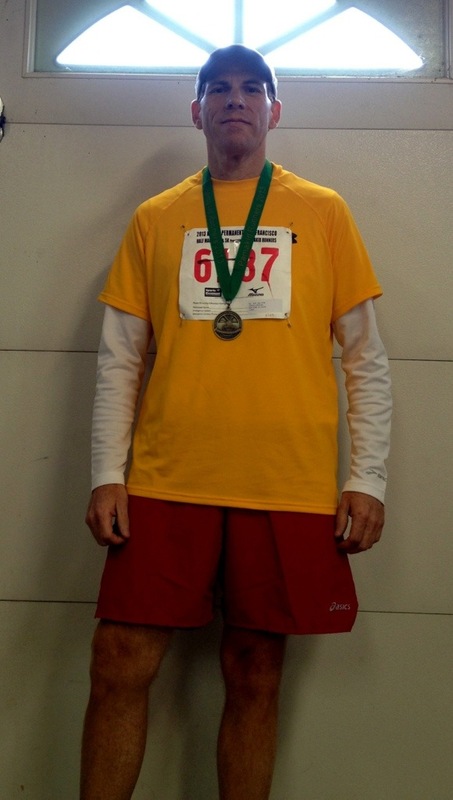 Since it was Super Bowl Sunday and I was in San Francisco, I broke form and wore 49er colors rather than my standard black shorts and usually-blue tech shirt/cool-weather cover (my wife says my kits are boring.) I have to admit, sadly, I was in the minority on this – not too many runners were wearing red, white, and gold or any “official” NFL clothing. I don’t think this says anything about football fans being non-runners/couch potatoes…at least I hope. The race was well-managed – doing it for 30 years, you know they’ve worked out issues – and the volunteers were amazing. I really liked how they had people at quite a few points along the course that called out gun time splits. I’m sure this was key for the folks at the front of the pack, but to do it for us mid-packers and others was a nice touch. The post-race festival was excellent. I would say that it was better than the 2012 Bay-to-Breakers’ and even, IMHO, the SF Marathon’s (at least the First Half portion from 2012.) The flow from the finish line, to medals, to shirts, to everything else was superb. SWAG was pretty good too and I got a $10 gift card from Sports Basement for saying, “I bleed red and gold” at their booth! I had read some reviews about the lack of SWAG and food and that wasn’t an issue this year – I got my water and banana and brought two Picky Bars from home to eat anyway. So my last two half marathons were within 14 and 17 days of a marathon, so I purposely went easy on them. Going into this race (7 weeks out from the marathon and 6 weeks into my training for Big Sur), I had “new PR” on my mind and planned accordingly. I knew that the 2-mile downhill section would benefit, but with it being so early in the race, I knew that I could crash and burn if I got too aggressive on it. My conservative goal plan was to beat my PR by at least :21 and I had a pacing chart taped to my water bottle to remind myself. Twenty-one seconds wouldn’t “crush” my 1:47:21, but I didn’t want to be greedy or too aggressive. My stretch goal was a PR by :30. I lined up between the 8 and 9 minute pace signs and waited for the start. When the bell sounded (this was in SF, so they used a cable car bell), I headed out – trying to stay on pace (read: slower not faster) but still weaving in and out of runner traffic. I thought about using my “on your left” alternative a few times during the first couple of miles, but decided not to. (yeah, I know the time and distance don’t add up. As you can see from my splits, I simply went for it. I kept telling myself to focus and conserve, but still went for it. 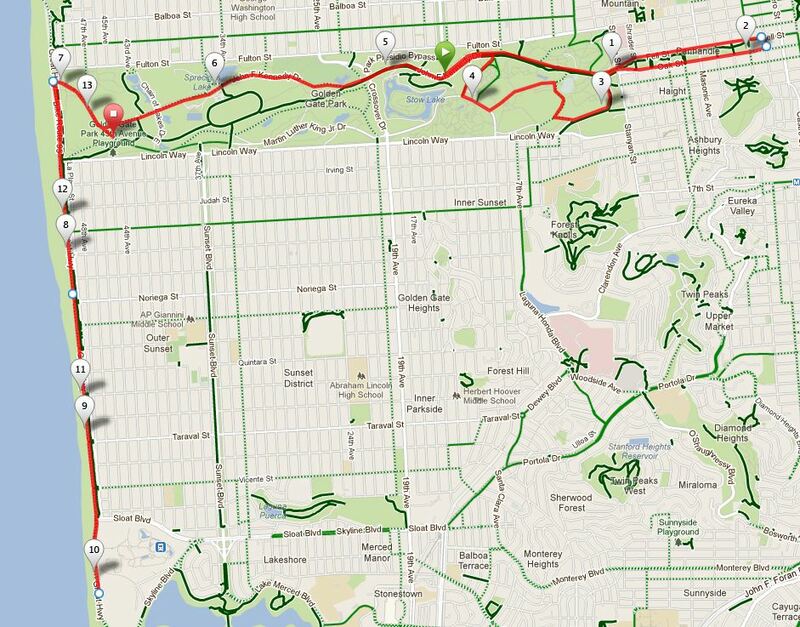 I recall making the turn at the Panhandle and telling myself to slow down and saw some for the last third of the race, so I did slightly…but then the downhill came. Still, I conserved on the downhill – really only benefiting by about :20 over two miles (I kept telling myself, “you not even half way there, dude! CHILL!”) Mile 12 was the tough one, I was tiring and purposely slowed a bit, wanting to finish strong in the last 1.1. 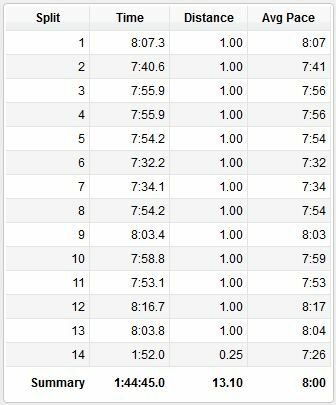 Actually, mile 11 was somewhat hard as well and, in reviewing my pacing and cadence for 11 and 12, I noticed that I slowed down/pause six times to between 9:48 and 13:59 pace. The key here was that I watched the lap pace on my Garmin and started running again when it started getting higher…I’ll call it strategic “resting.” I felt pretty good at the end of mile 12, so I kicked it into gear. That strategy paid off in a new PR by 2:36! BOOYAH!! I followed my normal pre-race carb loading plan (36 hours of >80% carbs and +500 calories above my normal day) and my usual race fueling plan (bagel at -3 hours, GU at -45 min, GU at -15 minutes, and 21oz of GU Brew and 3 GU Gels along the way.) At mile 2, I realized that I forgot to take a SaltStick and stressed a bit, but quickly forgot about it…or simply repressed my cramping memory from December. Post-race meal: Funny story… We had decided to go to El Burro for lunch and I was totally primed for a “personal basket of chips!” We got there and they were CLOSED! [insert “WAH, WAH, WAH, WAAAAAAAAH” sound effect] I guess they must have given their staff Super Bowl Sunday off. We ended up going to Boston Market instead and I chowed down a pot pie – yummy!